July, 1967, and Taste are settling into their residency at Belfast’s Club Rado in The Maritime Hotel. Already the Cork trio have picked up a loyal local following, and the ballroom is packed with students, sailors, working girls, local bands and music fans from across Northern Ireland. Some are merely curious, wanting to check the hot new ‘southern’ guitar-slinger in town; other are already converts and spreading the gospel that proclaims: “Taste are the best Irish band since Them!” The Rado’s atmosphere is thick with cigarette smoke and excitement as youths pack themselves against the stage, spilling beer as they cheer on the band. The three teenagers who make up Taste are enjoying themselves immensely. They play a dynamic mixture of blues covers and original songs, sounding raw and dynamic. Their 19-year-old guitarist and vocalist Rory Gallagher blazes up front, his T-shirt soaked in sweat while he caresses great rips of sound from his beloved Fender Stratocaster. Taste slow things for Catfish. Youths punch the air as Gallagher channels feedback into his solo, while sailors whoop with joy and hug the ladies they call “shore relief”. When Catfish finishes, Gallagher announces, “This one’s a new one I just wrote called Blister On The Moon.” He then plays a stinging riff and sings, ‘Everybody is saying what to do and what to think/and when to ask permission when you feel you want to blink.’ Right now, after years spent in showbands, being told what to play and how to behave, Gallagher is revelling in the freedom of making his music, his way. And Belfast loves him for his freedom and defiance. Admittedly, not all of Belfast does. Later that evening, after Taste finish their first set, Gallagher steps outside the Rado, wanting some fresh air and quiet. Suddenly, a group of youths surround him, and they aren’t ones he recognises from the venue. “Got a cigarette?” one asks. “Sorry, I don’t smoke,” replies Gallagher. Suddenly he’s set upon. Not for his lack of tobacco, but because his accent gives him away: he’s from the south and on the wrong side of town. Gallagher stumbles, almost falls, but manages to regain his balance as fists and feet rain upon him. He runs for his life and within minutes is inside Club Rado. Everyone notices Gallagher’s terrified expression and battered features. They don’t have to ask what happened. Instead, the Rado faithful empty onto the street, and suddenly the gloating gang are fleeing as music lovers teach the bigots a lesson. An unspoken rule at the Rado involves leaving religion, politics, whatever else, outside. Here Belfast gathers to celebrate the gospel of great blues and jazz and rock’n’roll. And throughout his life, Rory Gallagher always embodied such unity. If Taste took beautiful shape in Belfast across the summer of 1967 – a summer, locals noted, not marked by love – they would cease to exist in this same city some three and a half years later in the depths of winter. Taste’s final performance took place at Queen’s University, Belfast, on New Year’s Eve, 1970. As the band waited to go on stage for a final time, car bombs exploded across the city. On a wet, windswept, bomb-scarred Belfast night, Taste ended in an atmosphere as bitter as the city’s climate. Taste’s brief timeline runs like this: formed in Cork in late 1966, they quickly established themselves in Belfast in 1967, then began to win wider recognition with their regular forays at London’s Marquee. As their UK status rose, manager Eddie Kennedy insisted on changing the band’s rhythm section before they released their eponymous debut album in April 1969. This album achieved immediate continental success. The band were championed by fellow musicians – the likes of John Lennon and Eric Clapton publicly praised Taste before they even had a record deal – and they played support at Cream’s Royal Albert Hall farewell concerts, as well as touring the US opening for Blind Faith. Their On The Boards album (released January 1, 1970) won wide critical acclaim and chart success. Taste provided a standout performance at 1970’s Isle Of Wight Festival yet split acrimoniously at the end of that year. Rory Gallagher immediately set off on his solo career while the rhythm section formed Stud, a band as forgettable as their name is vulgar. A flurry of Taste live albums and a collection of 1967 Belfast demos were released across the 1970s, none with Gallagher’s permission or approval. Those who love Taste’s music must wonder why this band, who shone so brightly and so briefly, appear to have been banished. Gallagher refused to include Taste material in his live sets for the rest of his life: that he felt such enmity towards what he experienced in the band that took him from the showband circuit to international stardom suggests severe trauma. Yet the music contained on Taste’s two studio albums is superb: their eponymous debut is dynamic late-1960s blues rock, while On The Boards is a striking blend of blues, jazz, rock and pastoral psychedelia. Taste were both critically acclaimed and commercially successful, yet in the decades since they split up, their legacy has been marginalised. on paper, Taste epitomised the Aquarian ideals of the British counterculture. Combining youth and talent, a willingness to experiment and improvise, a dedication to playing for the people and an ability to bring Northern and southern Irish music fans together, Taste embodied the best principles of that era. 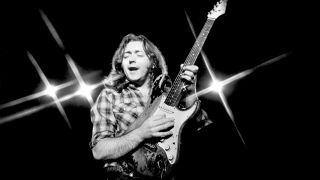 And Rory Gallagher, in his humility and honest passion, stood for all that’s good in rock’n’roll. But a duplicitous manager would ensure that Taste emerged from the 1960s as burnt and bitter as The Beatles. Perhaps even more so, because few tales of industry machinations are quite as sour as that of Taste. Nightmare number one was Taste’s manager, the late Eddie Kennedy. Kennedy, a Northern Irish music promoter, caught Taste’s first Belfast performance at Sammy Houston’s Jazz Club. Sensing talent and scenting money, Kennedy signed Taste to both a residency at the Maritime Hotel and a management deal. Seventeen-year-old William Rory Gallagher had gained a musical education way beyond his years in, firstly, The Fontana Showband and then The Impact Showband as they toured Ireland, the UK, Spain and Germany, playing pubs, dance halls and US military bases. Time in London playing the city’s Irish ballrooms had allowed Gallagher to check out that city’s many gifted musicians. He saw Davey Graham in folk clubs and John Mayall’s Bluesbreakers (with Peter Green) in pubs, and it made him determined to lead a stripped-down R&B band. His last showband engagement, at Hamburg’s Big Apple club, found him leading The Impact Showband as a trio. When the Big Apple club’s manager asked where the missing showband members were, Gallagher swore they were all stuck in London with food poisoning. After a week, the manager surmised that he’d been told a fib but Gallagher played with such passion and skill, he let the 16-year-old continue his residency. Back in Cork, Gallagher retired The Impact Showband and set about forming his ideal band, poaching Norman Damery and Eric Kitteringham from The Axills (Cork’s “answer to The Beatles” at the time). With Dublin being a soul music town, Taste found Belfast more responsive to their blues-drenched sound, and with Eddie Kennedy making promises, the trio settled there in 1967, initially living in the Maritime’s tiny, cell-like rooms (it was built as a residence for sailors between ships). Van Morrison’s Them had made their name playing at the Maritime Hotel and were now internationally famous, and Kennedy saw in Taste a band who could follow in Them’s footsteps. As Kennedy regularly booked English bands to come and play at the Maritime, Taste mastered their craft opening for the likes of Cream, Fleetwood Mac and Chris Farlowe’s Thunderbirds. Kennedy’s connections with Robert Stigwood (manager of Cream and the Bee Gees) meant he could get Taste – or The Taste as he initially insisted they were billed – gigs at London’s celebrated Marquee Club. In late 1967, Taste visited London, living out of their van and opening for anyone and everyone. Word spread about the beautifully raw Belfast band and when they returned to settle in London in early 1968, they were soon headlining nights at The Marquee. “The Marquee was huge back then,” recalls Donal. “This was before they put a bar in so you could pack about 1,500 people in. There was no such thing as health and safety and as it wasn’t licensed, no one ever checked on it. The Marquee was also a place where promoters from across Europe would come to check the new talent. “After one of Taste’s first London gigs in 1967, this guy from Nottingham, who booked The Boat House, offered us a fiver to come up and support Captain Beefheart. We leapt at it. The fiver probably covered the petrol! I remember we stayed at the worst dosshouse in Nottingham, along with about 30 lorry drivers! But the gig was great and Rory was very impressed by Captain Beefheart and his band as they had strong blues and jazz influences. Taste then got booked to play at the Woburn Abbey Festival on July 7, 1968. Woburn Abbey was one of the first British rock festivals and the bill featured the likes of Jimi Hendrix and Donovan. Taste were still unsigned at the time but they produced such a dynamic performance that John Peel, the former pirate radio DJ whose Perfumed Garden show on Radio 1 featured rising stars of the rock underground, told Gallagher that he would make sure Taste got a BBC session. Peel had already begun playing Taste’s debut 45 Blister On The Moon. This had been released on Belfast label Major Minor without the band’s consent. The two songs were taken from a demo and it’s likely Eddie Kennedy allowed the single to come out to generate major label interest. Taste were now rising stars of the British rock scene – John Lennon had attended a Marquee performance and subsequently told a New Musical Express writer: “I heard Taste for the first time the other day and that bloke is going places” – and Polydor expressed interest in signing the band. Kennedy then insisted that the rhythm section be sacked. He told Gallagher that this was at Polydor’s insistence, the label deeming the rhythm section not good enough (listening to the Woburn Abbey concert proves the lie in this). Gallagher said he was having none of this and they would have to find another label. But – and Donal is unsure why – he then backed down, and Damery and Kitteringham were sent back to Cork while Ulster musicians John Wilson and Richard McCracken were drafted in on drums and bass. Wilson-McCracken had recently played in Cheese, a Belfast band Kennedy had managed. The new duo were both gifted, experienced musicians – Wilson had been a member of Them and played on their second album, Them Again – and they quickly clicked with Gallagher. Taste’s new line-up signed with Polydor, with Kennedy promising the band that the label would allow them the kind of independence The Who and Cream were then enjoying. What he didn’t tell them was that as they were minors – the legal age for contracts back then was 21 – it was Kennedy who was signed to Polydor, while the members of Taste were individually under contract to him as employees. Not that the band paid any attention to the intricacies of contracts, preferring to concentrate on taking their music to the people. Taste settled into two Earls Court bedsits with Rory and Donal sharing one – “two singles beds, a closet, a cooker, a washbasin” – and Wilson and McCracken in the other. The band toured in an old Ford Transit van, playing wherever they were booked. So rooted in playing a highly personal form of blues rock were Taste that Eric Clapton, frustrated by Cream’s inter-member acrimony, insisted they play at the Royal Albert Hall as part of Cream’s farewell concerts. Taste, still without an album out, were thus anointed as Cream’s heirs. “Cream performed two shows in one evening at the Royal Albert Hall,” recalls Donal, “and that was a pity as it meant everything was rushed. Apparently it was because they could only book the Royal Albert Hall for one night and so they squeezed the two shows in. Also, Tony Palmer was filming the shows and I think he liked the idea of shooting both of them on one day. Yes were also on the bill so for the first show Taste opened, and then for the second show Yes opened. While the Royal Albert Hall concerts turned the spotlight on Taste, it also brought about a degree of derision: as Cream and Jimi Hendrix had pioneered the power trio format, Taste were dismissed by certain London scenesters as mere Irish copycats. “Rory formed Taste in 1966 with no intention of copying anyone,” says Donal. “He was friendly with Jack Bruce, having met him in his Hamburg days, and loved the early Yardbirds – their raw, raunchy blues – but he never aimed for Taste to be like Cream. Obviously Cream had been trailblazers in America so they paved the way for Taste. But if you listen to the Taste albums, they sound nothing like Cream. As Taste’s live reputation continued to grow, Polydor determined to get them into the studio and hired Tony Colton, a highly-touted British singer-songwriter who was, at that time, fronting Heads Hands & Feet as producer. Taste’s self-titled debut album was recorded at De Lane Lea Studios, a facility in the centre of Soho, in one day. The next day was devoted to mixing the album. Released in April 1969, Taste’s debut album is, essentially, their live show. It opens with Gallagher’s anthem Blister On The Moon, finds him rearranging blues standards Leavin’ Blues, Sugar Mama and Catfish, and touches on the psychedelic flavours then prevalent with Born On The Wrong Side Of Time. He bemoans life spent up and down Britain’s then-primitive motorway network with Dual Carriageway Pain, which is followed by a handful of unremarkable Gallagher originals, then the album closes with country singer Hank Snow’s anthem I’m Movin’ On. This gets played in a remarkably straightforward manner, harking back to Gallagher’s 1950s childhood in Ballyshannon where he was taught the song by his Uncle Jimmy, who returned to Northern Ireland after having worked in Detroit’s car plants. Taste received largely positive reviews – Gallagher noted that it was “raw and honest” – and sold strongly in northern Europe. The band stayed on the road and went on to break The Marquee’s attendance record (previously held by Jimi Hendrix), but they remained on the same tiny salary Eddie Kennedy paid them. They may have now been internationally celebrated recording artists but they continued to live in grimy Earls Court bedsits. “Earls Court was dubbed ‘Kangaroo Valley’ back then due to the huge number of Aussies living there,” says Donal. “The bedsit was very cramped and you had to feed the gas meter with an endless supply of coins to be able to cook or get heat. I would always be going off to the local laundry to do the band’s washing – Rory would just sweat through everything on stage – and the lady who owned the bedsit saw me doing this and installed coin-operated washing machines in the basement of our building. In winter, the laundry basement was the warmest room in the building so we would huddle down there, and Rory found it was a place where he could practise guitar and saxophone without annoying the other people living in the building. Eric Clapton’s enthusiasm for Taste remained strong and saw that the band were invited to support Blind Faith on their US tour across July and August 1969. While Taste played well, Blind Faith were imploding and, Donal recalls, the tour was poorly organised. Taste were well received by US audiences and their debut album on Atco (Atlantic) entered the Billboard and Cashbox charts, but Eddie Kennedy had done little for the band there and, at the tour’s end, they found no further US dates booked. Back in London, Polydor requested that Taste re-enter the studio with Tony Colton to record album number two. This time they were given almost a week to get things done. And Gallagher, emboldened by success and determined to pursue his musical vision, stretched out on what would become known as On The Boards. Gallagher composed all 10 tunes and demonstrated a versatility few could have imagined. Alongside driving blues rockers were acoustic ballads and experimental jazz-blues fusions, with Gallagher playing alto saxophone. No one else in contemporary rock music was creating anything comparable and when On The Boards was issued on January 1, 1970, it entered the charts across Europe and attracted hugely complimentary reviews. Yet when Polydor issued opening track What’s Going On as a single in Germany – it was a Top 5 hit there – Gallagher was furious. Just like Led Zeppelin, he refused to allow singles to be issued from albums. As for Gallagher’s skill on the alto saxophone, which would never feature prominently on his albums again, Donal recalls his brother teaching himself in their bedsit. By the time Taste came to play the Isle Of Wight Festival on August 28, 1970, the band were on the verge of splitting. Rory and Donal both knew that Kennedy was looting Taste, yet Wilson and McCracken sided with their manager. Just as Noel Redding had resented the attention Jimi Hendrix received, Taste’s rhythm section spoke bitterly of how the focus on the band appeared to be all “Rory, Rory, Rory”. Yet the Isle Of Wight ignited around Taste. Murray Lerner, who was shooting a film of the festival, had planned on only shooting one or two songs of Taste’s set, but they were so exciting and the audience response so strong that he kept the cameras rolling for much of the band’s performance. It’s this footage that features on the Taste Live At The Isle Of Wight DVD. Once the European tour was over, Gallagher made it clear that Taste also were. Gentle as he may have been, he knew he had been robbed by Kennedy and was furious at his bandmates’ disloyalty. He agreed only that the band should play a farewell concert in the city that launched them: Belfast. Finishing on New Year’s Eve appeared suitably symbolic. “We performed two shows on the same day,” says Donal. “I guess it was because everyone was trying to earn their last crust. I recall their performance had an eerie feeling to it as they were playing beautifully, playing great music, but very soon it was to be no more. The second concert was at Queen’s University and as it came up to midnight, 11 car bombs had gone off across Belfast. And everyone was saying that the 12th car bomb would go off as it hit midnight. So we were all waiting for this ominous moment. Gallagher quickly moved on, establishing himself as a hugely successful solo artist. Peter Grant saw off Eddie Kennedy – who initially claimed to “own” the frontman – but Gallagher never saw any of the funds Taste had earned across their four-year existence. As Donal got more involved in managing Rory, he determined to resolve the Taste conundrum. Then, in 2000, Wilson and McCracken revived the Taste name (with Sam Davidson doing Gallagher’s guitar and vocals) and went out on the road. If the Gallaghers and the rhythm section had put their differences behind them in the 1990s, this ‘reunion’ again proved divisive. What Donal has done is get Taste right. The I’ll Remember box set and Live At The Isle Of Wight DVD (“I contacted director Murray Lerner and said, ‘I don’t want my descendants talking to your descendants so let’s get this done’”) capture one of the most remarkable bands of their era. They only existed for a few brief years but the music they created then touched many. And now, treated with the respect Taste deserve, it will continue to do so. _I’ll Remember is out on August 28 via Universal. _See www.rorygallagher.com for more information. Trombonist Chris Barber (born in 1930) is a towering figure in British jazz and blues. Barber started leading a professional band in 1953, helped launch the careers of Lonnie Donegan and Alexis Korner and brought the likes of Sister Rosetta Tharpe, Muddy Waters and Sonny Boy Williamson to the UK to spread the blues gospel. Barber was also co-owner of The Marquee Club in Wardour Street, London, and it was here he came to experience another gifted young bluesman. “I knew of Taste through contacts in Northern Ireland – my first wife, the singer Ottilie Patterson, was from Belfast, and I’ve always kept my ears open for players from there. I had my offices above The Marquee so it wasn’t difficult for me to drop down and hear them. They were playing this bluesy, experimental music, very distinctive, quite individual from what a lot of the new British blues bands were playing. “I’m always happy to see people doing the kind of blues I like, and it was immediately obvious that Rory was one of the few virtuoso players out there. There were lots of guitarists out there who got a good sound, but Rory’s playing left you open-mouthed. I listened for a while then went and got my trombone and joined Taste on stage for a jam. It might sound odd, a trombonist joining an electric rock trio on stage, but I could hear a real depth to Rory’s playing – he knew his jazz and blues! – so we matched easily. He played slide guitar, which is very similar to trombone. The trombone can express a great variety of sounds, you can give it real feeling, and it’s the same with slide guitar. So there we were, trombone and slide guitar, jamming at The Marquee. And it was great. “We kept in contact over the years and occasionally Rory played on sessions of mine – he appears on a few of my albums. He’s on my 1972 album Drat That Fratle Rat!, playing beautifully. Both Rory and I spent so much time on the road touring we didn’t get to see one another as much as I would have liked to. But that’s the musician’s life – the profit and loss of it is that you keep working but you don’t get to see people very often.